Get WALKING Shoes and NOT Running Shoes! Walking: Body load -> First strike is on the Heel –> need cushioning at the heel. 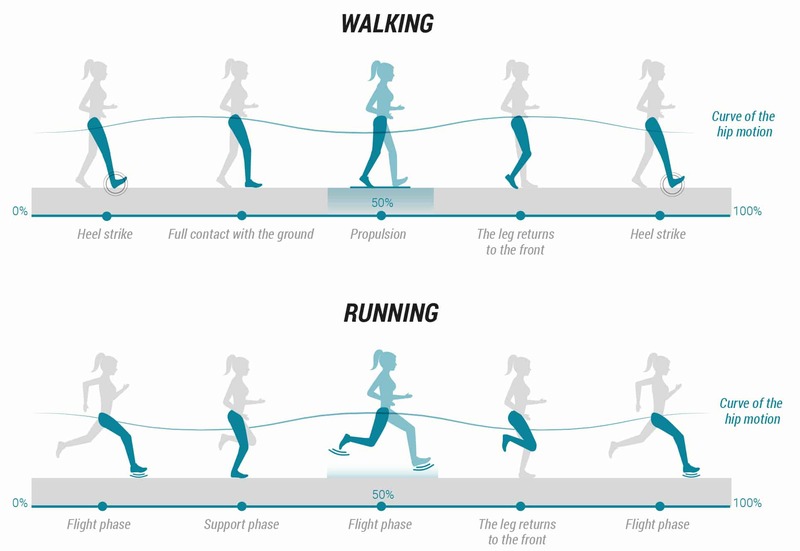 Running: Body load -> First strike on the Mid-Foot -> need cushioning at the mid-foot. 1 First strike with your heel. 2 Gait cycle via the mid-foot. 4 Propel forward via the ball-of-foot & toes. 1 First strike with ball-of-foot (or mid-foot). 4 Propel forward via the ball-of-foot. All Major Athletic Shoe Brands are aware of the foot-strike difference. Walking Shoes: Cushioned Heel & Flexible Mid-Foot. Running Shoes: Cushioned Mid-Foot & Elevated Flexible Heel. Overpronation is excessive inward rolling of the feet after landing instead of pushing off forward. Usually occurs in people with flat feet. This Condition can lead to knee pain, ankle pain, and plantar fasciitis. Neutral Pronation is having an ideal foot-strike. It is characterized by a slight inward movement of the ankle-bone during the foot contact with the ground. Natural foot motion allows you to effectively absorb shock on impact, and evenly distribute weight on push off. Underpronation is a condition when there is excessive outward rolling of the feet after landing instead of pushing off forward. Under-Pronation usually occurs in people with high arches. This condition can lead to knee pain, ankle spring, and hip pain.